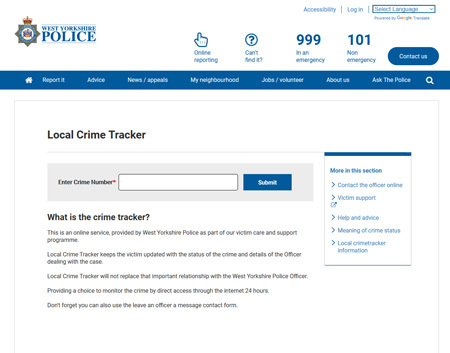 Welcome to the West Yorkshire Police Local Crime Tracker service - as part of our commitment to offering greater choice and new ways to communicate with victims of crime. Whilst we accept it will not replace the important relationship with a West Yorkshire Police officer, in person, it will give you more choice about how and when you get information. The service offers convenience as it allows you to see what status your crime is at and allows you to ensure that you have details of the officer who is dealing with your case. Access to our new Contact the Officer on Line is also available to send messages at any time. Please click here to enter Local Crime Tracker.